If you are trying to open project plan and it appears as checked out in the File-> Open dialog box, it means your previous connection to project server was interrupted or if Project Professional is closed abruptly before you can check in a project. 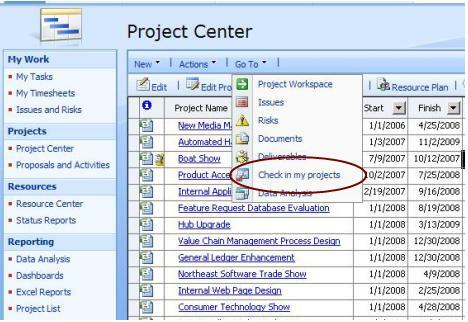 You can force a check-in of your own project by using the "Check in my projects " link in the Project Center. Please note, this feature only to check in projects that you checked out by you; you can not check in project that was checked out by another user. Only a Project Server administrator can check in a project that is checked out to any user. Review the Job State column, if it says �Processing�, it means still system is processing your check-in request. Refresh browser and make sure your request has been processed.